A great way to use the hot coals of your braai while cooking your meat. You can also roast the cabbage in an oven set to 200˚C for 1 – 2 hours. For the cabbage, place the charcoal in the braai. Arrange 4 – 5 x 1cm pieces of firelighter between the pieces of charcoal and set alight with matches/a lighter. Once the coals are hot and the flame has died down, scatter the soaked wood chips in an even layer over the coals. Make a well in the centre of the coals and place the large purple cabbage/ 2 small purple cabbages in it. Cover with the coals and allow the cabbage to cook until soft, about 1 hour to 1 hour and 30 minutes. To check if the cabbage is cooked, insert a sharp knife into the centre to see how soft the layers are. Once the cabbage is soft and cooked through, remove it from the coals and wrap it in cling film. Set aside until needed. For the vinaigrette, combine the lemon zest and juice, mustards, olive oil, crushed garlic and maple syrup in a medium bowl. Mix until well combined. Add the chopped chives and season to taste. 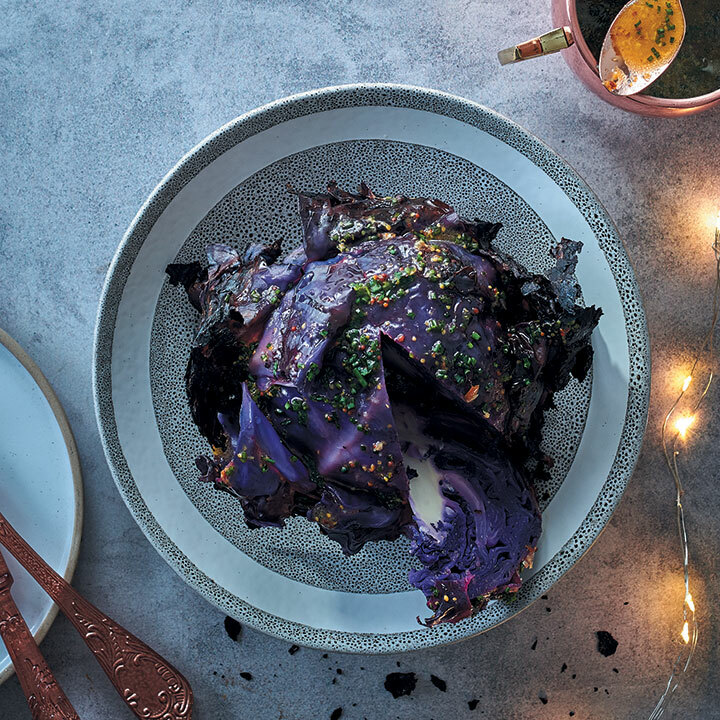 To serve, unwrap the cabbage and remove the first layer of charred leaves. Cut the cabbage into wedges and serve with the vinaigrette alongside, to drizzle.